As I am sure you know, there are now only a few weeks to go until the 2018 Ronhill West Highland Way Race. I hope your training has gone well and you are in the best possible shape for the race. Please read the instructions below carefully, and return the support crew information by Friday 1 June. It is important that you take the time to read over and understand the points below. Read the final instructions and WHW Support team brief 2018. Then read it again to make sure you have not missed anything. WHW Support and Medical Details, and email it to me by 1 June at the latest. Ensure that your support crew have read and understand the instructions, particularly the sections that directly affect them. Look out for an email about merchandising, which will arrive soon. Good luck with the final part of your training, and I look forward to seeing you at Milngavie on the evening of 22 June. Registration takes place on Friday 22 June 2018 between 9.00pm and 12.00 midnight at St Joseph’s RC Church Hall in Milngavie. The church hall is located across the road from Milngavie Station, where the race starts. At registration you will be given your race number, which will also be your timing device to be used at each checkpoint throughout the race, and a numbered race band which should be worn until you finish or withdraw. All runners will be required to show photographic ID to collect their race number. You will be given your goody bag and any merchandise you have purchased, and be given support crew parking permits for the Beinglas Farm and Auchtertyre checkpoints. You will be weighed and given your weighing card, which will need to be produced later at the weigh-in stations at Auchtertyre, Kinlochleven and Fort William. We would encourage those who are able to do so to register as early as practical, to help reduce congestion later in the evening. The station car park can get very busy with race traffic. If you are unable to park there, additional parking should also be available in the nearby Tesco which remains open well into Friday evening. A short race briefing will take place near the start line at 12.30am. Race numbers will be posted on the website a few days before the race. 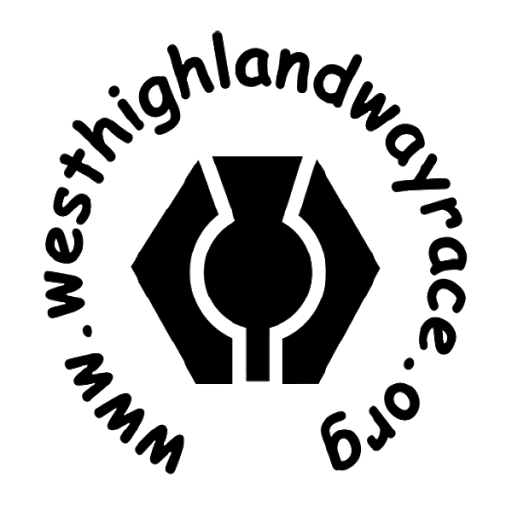 If you would like to be allocated a special race number please send details to ianbeattie@westhighlandwayrace.org by no later than Friday 2 June and I will do my best to meet your request. Numbers can be requested from 1 to 225. The race will start at exactly 1.00am on Saturday 23 June from the start of the West Highland Way, at the bridge beside Milngavie station. Any runner not reaching the checkpoint within the allocated time will be withdrawn from the race. This will be based on the electronic timing and all cut-off times will be strictly enforced. It is a condition of entry that any runner failing to reach a checkpoint within the designated timescales surrenders his / her timing card and does not continue in the race. The only exception to this is where a runner has stopped to help another runner in trouble and this has caused him / her to miss a cut-off; in that case the runner will be referred to the Race Safety Officer or Race Director, whose decision will be final. All runners will be weighed at Milngavie, at Auchtertyre, at Kinlochleven, and at Fort William. If a marshal is concerned about the condition of any runner, this will be referred to the Race Doctor, the Race Safety Officer, or the Race Director. They will determine what action, if any, needs to be taken: this could include a variety of measures including, if considered appropriate, instructing withdrawal from the race. Such an instruction would only be given where it was considered necessary for the runner’s own safety, and would not be taken lightly. However it is a condition of entry that any such instruction must be followed, and the decision of the Race Doctor, Race Safety Officer or Race Director is final. No food or water is provided at any checkpoint; it all needs to be carried by the support crew. Each runner will be issued with a SPORTident Timing Card (SI-Card) at registration. At each of the checkpoints shown above, plus at the timing points at Rowardennan and Lundavra, you need to lay the SI-Card flat over the hole in the SPORTident Timing station and the station will beep or flash. This indicates that a timestamp has been recorded on your card. This procedure is an essential requirement of the race. Follow the same procedure at the Finish and hand your SI-Card to the SPORTident Timing Team. You will be given a small printout showing your split times through each checkpoint on the route. Each time you register your SI-Card at a checkpoint, data is uploaded onto the SPORTident webserver in real time. This allows Friends and Family to follow your progress throughout the race, either at home on a computer or on any web enabled phone as they support you along the route. Details of the website link will be confirmed in nearer the race. This should help your friends to plan where and when they will meet you during the race as the information it provides includes an ETA for each runner at the next checkpoint. Should you need to retire during the event, wherever possible please hand in your SI-Card at a checkpoint on your route. If you are “rescued” by a support vehicle, please ensure that you deliver your SI-Card to the NEXT checkpoint on the course. Until each SI-Card has reached the Finish or been handed in at a checkpoint, the event organisers will assume that you are still on the course. Failure to hand in your SI-Card at the event will cause an unnecessary search by rescue teams and you may be barred from taking part in future events. There is a charge of £30 for each SI-Card that is not handed in. Specifically, please do not take Ibuprofen or other NSAIDs, such as naproxen or diclofenac. These can cause serious medical probelms during endurance events and if we become aware of any runner taking Ibuprofen or other NSAIDs that runner may be disqualified. It is also very important that you note the dangers of over-hydration, and ensure you only drink to thirst. We would advise that you remove all rings before starting the race – we have recent experience of a runner’s fingers swelling badly during the race, leading to their ring having to be cut off. As in previous years, we are insisting that every runner carries a lightweight space blanket throughout the race. These only cost a couple of pounds from any outdoor shop, and could make a significant difference if you are unfortunate enough to have a fall, particularly if it is in a remote part of the trail. In the event of an emergency, Sean should be the first point of contact. If contact cannot be made with Sean, Ian is the second point of contact. Remember, conditions can vary considerably throughout the course of the race and it is better to carry too much kit in your support vehicle than find yourself short. No competitor is allowed to use walking poles at any stage of the race. Dogs are not allowed to run with any competitor at any stage of the race, nor are they allowed to run with any person who is supporting a runner. This is a condition of our event insurance. iPods/MP3 players are permitted, but competitors must be able to hear what is going on around you at all times. Earphones must be removed at checkpoints, at road crossings, when approaching marshals, and at all times when running on public roads. If a marshal signals you to remove your earphones, you must do so immediately. There will be a facility for runners to leave dropbags for Rowardennan and Inversnaid. Please ensure these drop bags are clearly marked with your race number, and take them to the marked vehicle at the start at Milngavie Station. It will not be possible to return the contents of any drop bag to you after the race. The West Highland Way is a route of outstanding beauty, and we try to ensure our race is well regarded by the West Highland Way rangers, by those living near the route, and by other users. To this end please make sure you do not drop any litter anywhere on the route, but that you carry it with you to the next checkpoint. Please also show consideration for walkers and other users. In previous years we have had complaints from residents at Drymen about the noise made by support crews. To try and address this we would discourage support crews from meeting their runner at Drymen at all. If you do intend to go there, you must not park either on the main road or in the dead-end road outside the houses. Instead you should park on the road heading down towards Drymen or in the car park in Drymen village, then meet your runner in the field before the route crosses the road. We will have marshals in place to make sure this is enforced. We have also had complaints in the past from Kinlochleven residents about the noise levels during the Saturday night / Sunday morning. We are very keen to maintain good relations with people who live near the route, so please make every effort to keep noise to a minimum, particularly during the hours of darkness. Noise at the finish at Lochaber Leisure Centre can also cause problems during the night-time hours. Again we would ask you to respect the local residents who do not wish to be disturbed. The race follows the ‘low path’ between Rowardennan and Inversnaid, instead of the high route that was used prior to 2016. The turn off for the low route is just less than 2 miles north of Rowardennan, and one third of a mile after the gate at Ptarmigan Lodge. It is well signposted. This year we will be using an alternative route in to Kinlochleven. On reaching the bottom of the water pipe, runners should take the route past Blackwater Hostel and Campsite, pass the Ice Factor, turn right at reaching the main road, and head in to the checkpoint at the Leven Centre. This will be well signposted. Parking in the area between the top of Loch Lomond and Crianlarich is very limited, and we have had problems in previous races with businesses and landowners in that area. This year we are fortunate to have access to Beinglas Farm. This is an official checkpoint and all crews are required to meet their runner there. Parking space is very restricted, however and only one support vehicle per runner is permitted to access the checkpoint. The parking permit which was issued at registration will need to be shown to gain access to the checkpoint. Please note that access to Beinglas Farm will only be available from 7.00am onwards – do not attempt to access Beinglas Farm before this time. Apart from the official checkpoint, support crews are not permitted to meet their runner at any point on the A82 between Beinglas Farm and Crianlarich. This restriction includes Derrydarroch Farm, Carmyle Cottage, and any of the lay-bys on that section of the A82. This will be strictly enforced, and any breach could lead to a time penalty or even your disqualification, so please make sure that your support crew are aware of this rule. If your support crew wants to meet you after the Beinglas Farm checkpoint but before the next checkpoint at Auchtertyre, it is possible to park in Crianlarich, walk for a mile of so up the hill, and meet your runner at the point the West Highland Way comes in to Bogle Glen. Parking is also restricted at the checkpoint at Auchtertyre. The one vehicle per runner rule will also apply at this checkpoint, and your crew will need to show their parking permit to gain access. Your support crew should not arrive at either Beinglas Farm or Auchtertyre too early. If they are planning on having a sleep before your arrival, they should do this in a safe place well south of Beinglas Farm, such as the car park at Inveruglas, or a car park in Balloch at the southern end of Loch Lomond. It is a condition of entry that all runners must have motorised back up for the full duration of the event. Up until Auchtertyre you need at least one crew member, and from Auchtertyre onwards you need a crew of at least two people, one of whom must be capable of accompanying you during the last two stages if required. You are required to provided details of your support crew by completing the attached form and e-mailing it to [ianbeattie@westhighlandwayrace.org]ianbeattie@westhighlandwayrace.org. This form needs to be completed and submitted by 1 June. You will not be allowed to take part in the event unless these details have been provided. Please submit your details using this form and not by any other way: it makes it much easier for the organising team to access the information if required on race day. If there are any changes to your support crew details after you have completed the form, please complete it again and e-mail it to me at the same address to let me know. The Support Crew must meet their runner at each Checkpoint. It is the Support Crew’s responsibility to ensure your safety between Checkpoints, and they must be prepared to look for you if you do not check in at a Checkpoint. The check point marshals will advise on whether a runner is able to have a support runner. If you are ahead of these times, your support crew are only allowed to run with you in the area one quarter of a mile before the checkpoint and one quarter of a mile after the checkpoint, and are not allowed to run with you at any other times. The support crew are however allowed to meet you at any safe point on the route, except the section between the top of Loch Lomond and Crianlarich as outlined above. Please note that in the event of particularly adverse weather, all runners may be instructed to ‘pair up’ with a member of their crew or another runner for any of the later stages of the race. Many of the roads on the route are narrow and not suitable for a large campervan / motorhome type of vehicle. We would recommend that this type of vehicle is not used at all for support, but in particular large campervans are not permitted for travel to Rowardennan, Beinglas Farm, Auchtertyre or Lundavra. At Bridge of Orchy campervans are prohibited from going down the minor road to the checkpoint, and must park in the car park just before the Bridge of Orchy Hotel. We have had a number of problems with large campervans in the past, and it is important that support crews use common sense in their choice of vehicle. For the same reason no large campervans are allowed in to the Lochaber Leisure Centre car park at the race finish. We reserve the right to withdraw any competitor whose support crew or support vehicle are causing serious problems for the smooth operation of the race. A number of businesses on the route have kindly agreed to open their premises and provide facilities for support crews. The Oak Tree Inn in Balmaha (19 miles) will be open from around 2am and will offer hot rolls and refreshments, as well as the use of their toilet facilities. There is a café / shop at Auchteryre Farm (51 miles). The cafe at Glencoe Ski Centre (71 miles) will stay open late on the Saturday night and will serve food until 10pm. There are a number of pubs and a fish and chip shop in Kinlochleven. We are very grateful for the help of these businesses; please support them if you can. The race finish is at the door to Lochaber Leisure Centre in Fort William. The Leisure Centre is about 0.2 miles beyond the roundabout as you come in to Fort William, on the left hand side of the road. At the finish your time will be taken and you will be weighed. Showers are available for runners and crew (this will be badly needed! ), and facilities are available to make tea and coffee. Please note that no alcohol is allowed in Lochaber Leisure Centre, nor in the car park outside. All runners will receive a Ronhill race garment and a buff in their goody bag. Additional race merchandise for yourself or as a ‘thank you’ for your support crew will be available for purchase. We are currently in the process of finalising the merchandise, and will e-mail you soon with details of what is available and how to place an order. The prizegiving will take place in the Nevis Centre, Fort William at 12 noon on Sunday 24 June. Please try and attend – it is a great occasion where every finisher is presented with his or her hard earned goblet, and helps continue the great ‘family’ feel of the event. The Nevis Centre will serve breakfast from 10am. If you are unable to attend, please let a marshal at the finish know and we will arrange for you to take your goblet away with you. For those staying in Fort William, there will be the chance to meet up for drinks and some food on the Sunday evening. This is an informal gathering and all are welcome – it will take place from 7pm in The Great Glen, 104 High Street, Fort William. If you need to withdraw from the race, please notify this by e-mail toianbeattie@westhighlandwayrace.org . A refund of £70 will be made for withdrawals notified on or before 31 May. No refunds will be given for withdrawals notified after 31 May, but it is still important that you let us know. Please note that it is not possible to defer any entries to the following year’s race. The race twitter site can be followed at @WHWRace. If you or your support crew are tweeting before, during or after the race, please use the hashtag #whwrace. The race also has a Facebook page which will provide updates. The entry procedure for the 2019 race will be similar to this year, with entries open throughout November 2018.